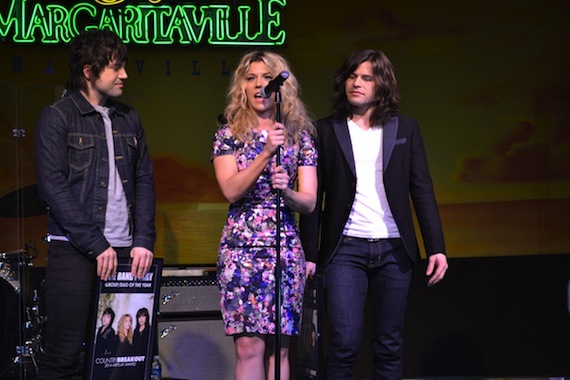 MusicRow presented its 12th annual MusicRow Meet & Greet and CountryBreakout Awards Tuesday (Feb. 18) at Nashville’s Margaritaville. A throng of industry members gathered to celebrate winners including The Band Perry, Blake Shelton, Miranda Lambert, Kacey Musgraves, Tracy Lawrence, Rodney Clawson, and MusicRow Reporter of the Year, WEIO Huntingdon, Tenn.’s Kelly Green. The afternoon event also featured performers Natalie Stovall and The Drive, and Native Run. See below for an array of photos from the awards celebration. A full recap was published earlier today. Select photos courtesy of Bev Moser.